Our electric bicycles - a2b ecycle - electric bicycle, sales & rental co.
a2b ecycles are designed by IGS Italy and look innovative and stylish. They have a unique design with a mid-mounted motor running the central axle through a gearbox. 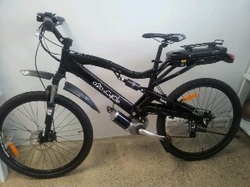 Get on, start pedaling and the pedal activated drive system does the rest, a rack of gears at the back and levels of assistance. Riders can pedal when they want, or even rotate the pedals backwards, while using the throttle. These next-generation cycles show no loss of traction as with front wheel hub motors, are better balanced than rear wheel hub motors, are virtually silent. Riders select how much or how little assistance they require when climbing an incline or riding into a headwind. They can even take a break from pedaling and use the twist grip throttle alone. Riders may choose to speed along the flat in top gear with almost no effort, or get a vigorous workout by riding up hills with little or no assistance. 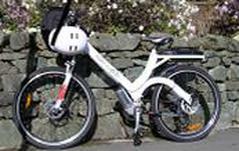 By removing the exertion and perspiration, a2b electric bicycles highlight the pleasure of cycling, putting riders in control of the amount of effort required to ride. Function: 5 modes of power, twist throttle, adjustable power assistance and cycle only. Frame: Strong aluminum alloy - 2 sizes available 3/4 frame and standard. Function: 3 or 5 power modes, twist throttle, adjustable power assistance and cycle only. Frame: Strong aluminum alloy - 3/4 frame or standard frame.